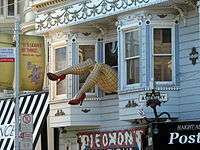 Haight Street, in San Francisco, is perhaps best known as the principal street in San Francisco's Haight-Ashbury district, also known as Upper Haight. It stretches from Market Street to Stanyan Street, at Golden Gate Park. It is named after California pioneer and exchange banker Henry Haight (1820–1869). ↑ "San Francisco Streets Named for Pioneers". Museum of the City of San Francisco. Retrieved 2007-06-01.